Making juiceOriginally uploaded by Chris and Jenni. It was a variation of the Green Lemonade recipe I posted the other day, only I used a lime instead of a lemon because they were on sale (it was okay but I think I would like lemon better), and I added two carrots, but didn’t have any kale. I plan to drink a glass of this Green Lemonade every day, but first thing in the morning I drink a Smooth Mama Shake-delicious and a great way to start off the day! my favorite is carrot spinach! 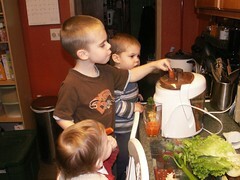 We love our juicer. I love putting tons of different veggies in there too. Hi Tammie, thanks for the comment, you said your favorite is carrot/spinach. Do you just do those two? It’s good to hear other people’s likes/dislikes. How are you doing? How’s your pregnancy going? Hey that looks exactly like my jucier. I think it is the same juicer, the bummer though is that I lost one of the rubber feet on the bottom so it’s unbalanced, I need to get another foot or figure something out! Jenni – Yes I just do carrot and spinach for my favorite drink. Other times I might do just a ton of veggies. Jenni, a year ago Christmas we were able to get rubber feet for my Kitchenaid for very cheap. what is the model and brand of your juicer?